It seems rather pointless bringing up anything remotely negative about Guillermo del Toro’s cinematic love-letter to geeks of all ages. The fact that it has some of the most banal dialogue seen since George Lucas reached for his typewriter to pound out those prequels seems almost besides the point. 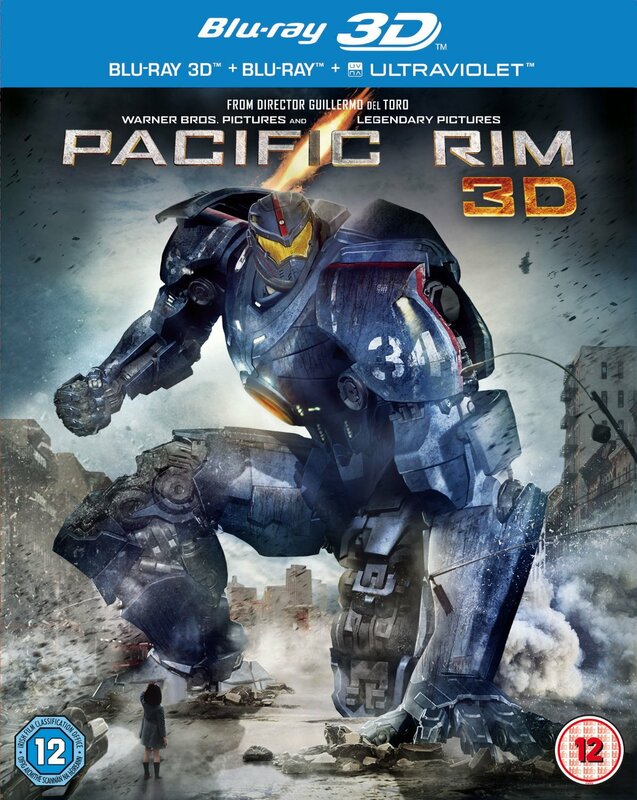 Pacific Rim doesn’t care about corny dialogue or average acting; its all about the enormous action set-pieces, the huge explosions, the frankly colossal mechs/robots and the bigger-than-skyscrapers monsters. Its utterly bonkers, a pure comic-book movie in its bold colours, its simple plot, its one-dimensional characters… to moan about all that seems to be missing the point. You are not meant to study the scripts for films such as this; Guillermo wasn’t trying to create art here (although many of the images are breathtaking). He was making a movie for the geeks, aimed straight at their King Kong-loving, Godzilla-loving hearts. Its also likely the nearest thing we’ll ever see to a Neon Genesis Evangelion live-action movie. Some of the shots of the mechs look like they are straight out of that anime- I’m sure much of it is intentional. Indeed geeks everywhere can no doubt play a game naming references/nods to all manner of genre material. Commander Stacker Pentecost (Idris Elba) is so much like Akira‘s Colonel Shikishima in dress, mannerisms etc its like he’s stepped out of a live-action Akira movie by mistake, as if he turned left instead of right on leaving his dressing-room and blundered onto the wrong set. There are the obvious homages to Godzilla sprinkled throughout the movie, so many we surely don’t need another ‘genuine’ Godzilla movie. It is a great fun movie, and I’d love to see where a sequel might go. If you can switch off your brain and relax, let its dumbness wash over you and succumb to the hypnotic jaw-dropping visuals you are in for a treat. Its certainly superior to any of the Transformers movies. My only reservation, is how many times can we see cities being demolished in huge cgi-action spectacles (Avengers, Transformers 3, Star Trek Into Darkness, Man of Steel…) before we are so jaded by it that it becomes, dare I say it, boring? Because in all of these movies, while the destruction is vast, the dramatic, emphatic involvement in what we are seeing is pretty much zero as it is. Man of Steel‘s Metropolis is pretty much wiped off the map with thousands maimed, crushed, burnt, killed, and yet its all a cartoon, not mattering a jot. Much the same can be said of the citizens of Sydney and Hong Kong and other decimated locations glimpsed in news reports during Pacific Rim. I know I’m missing the point. This isn’t that kind of movie. But with all this mad destruction in these movies aren’t we in danger of becoming so inured to the depiction of such violence and destruction that it doesn’t matter? Is all this comicbook nonsense reaching such a saturation point that it damages any impact of realistic/down-to-earth violence in movies? How much bigger/louder can Hollywood go with these comicbook movies anyway? After destroying cities becomes the norm, what next? 1982 was a hell of a year for movies – well, genre movies in particular. Blade Runner, The Thing, Poltergeist, ET, Star Trek: The Wrath of Khan, Conan The Barbarian, Tron, Mad Max 2/The Road Warrior, The Dark Crystal… one hell of a year indeed. Young ‘uns these days may watch those thirty-plus-years-old films and scoff at static matte paintings and blue screen bleed and physical effects etc whilst pointing fingers at the cgi-till-your-eyes-bleed wonders of many modern day tour-de-force blockbusters, but the films of 1982 were fresh and varied and so very different from one another. That year was the true climax, the promise of the Star Wars phenomenon of 1977 come to fruition, a Golden Summer of genre movies. It had taken five years but Hollywood had finally gotten its sci-fi/fantasy act together. Sadly, we didn’t realise back then that we wouldn’t see anything quite like it ever again. It just seems so remarkable looking back on it. I recall an ad in Heavy Metal magazine for Blade Runner saying something like “… Ridley Scott (Alien),Harrison Ford (Raiders of the Lost Ark), Douglas Trumbull (CE3K)…” well, no marketing budget can buy adlines like that; the coming together of talent back then was amazing. Now, this springs to mind one film I neglected to mention on that earlier list –Creepshow, a glorious horror anthology that might have had a similar adline, “…brought to us by Horror greats; George Romero of Night and Dawn of the Dead fame, famous novelist Stephen King and make-up wizard Tom Savini”. Well it certainly beats ‘from the producers of Hostel 2 or Halloween 5 or Alien vs Predator’. Inspired by the infamous 1950s EC Horror Comics, Creepshow was an affectionate nod back to those vaguely anarchic morality tales of horror, comics brought to life in bright four-colour photography. I’m not sure the film was really about being scary (although it does have some rather effective ‘jumps’ and shock moments), rather it always seemed about being fun. Now that may seem a strange thing to be saying about a horror flick but really, that’s what Creepshow was and perhaps is even more so today. 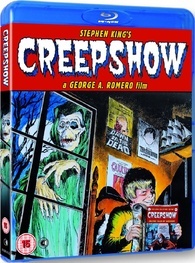 Just released last week in a handsome Blu-ray edition here in the UK, Creepshow is just fun, fun, fun. Sheer joy to watch. The cast is to die for- Hal Holbrook, Fritz Weaver, Leslie Nielsen, Ed Harris, Adrienne Barbeau, E.G. Marshall, Ted Danson… its a pleasure just to sit back and watch them do their stuff, with thoughts of the great films that were behind them and for others greater films still ahead of them. Even Stephen King gets to camp it up, starring as the ill-fated dumb farmer Jordy Verrill. Its cheap, its brash, its five tales are short and to the point. Ed Harris’ bizarre dance to even-more bizarre Disco music is worth the price of admission alone. Its a great little movie the charm of which just seems to improve with age. The old adage they don’t make ’em like they used to is never truer than it is for films like Creepshow. An unadulterated pleasure. The young ‘uns may well scoff at its dated charms, but hell, what do they know? Like the Arrow release of Lifeforce a few months ago (really, have we ever had it this good as we have of late? ), this release is loaded with great special features, including two audio commentaries and a 90-minute doc, that, while included in a SE DVD some years back has here, incredibly, been remastered in HD (that’s one in the eye for Warner whose releases of Blade Runner have all failed to present its film-length Dangerous Days documentary in HD). Add in a Savini doc, deleted scenes and galleries of VHS art, posters, lobby cards and pressbooks… for any fan of this film its a sumptuous pinch-me-I’m-dreaming release. Wonderful stuff. It would be rather foolish of me to suggest that The Witches is some kind of forgotten classic, a horror gem. Its strictly an average, below-par Hammer film, and yet it still has much to recommend it. 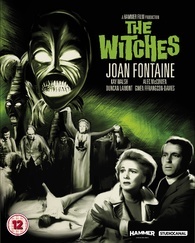 Joan Fontaine plays Gwen Mayfield, a teacher who has returned to England and is returning to her profession after suffering a breakdown whilst working in Africa, caused by a nightmarish experience involving witchcraft (this experience features in a rather needless prologue that is really the only notably true ‘Hammer’ moment of the whole film). Hired to be the head schoolteacher of a quiet and remote village school, she arrives to find the villagers very pleasant and friendly, and the village itself idyllic and beautiful. But as she spends more time there she begins to suspect that there is a darkness in the background, and that perhaps this perfect rural existence is a mask hiding true terrors within. The villagers frown disapprovingly at a blossoming childhood romance at the school, the boy falls ill suspiciously and later the girl mysteriously disappears. Incredible as it seems in such a quaint, pleasant and God-fearing (albeit the Church is, yes, a ruin) village, an old woman with a black cat appears, yes, to be a Witch… and perhaps not alone in her dark magic… The shadows of Mayfield’s earlier breakdown at the hands of witchcraft threaten to overwhelm her once more.